"You're going to self-destruct? 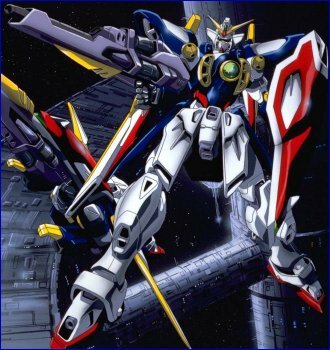 That's not a bad plan either..."
Wing Gundam, the perfect killing machine designated to the Perfect Soldier. Though it boasts no distinctive or unique power or weapons capabilities, Wing is the only one of the gundams that can transform into bird mode, thus making speed an easier goal with its streamlined shape. Featuring the lethal buster rifle with enough energy to tear through hordes of mobile suits and the beam saber that can also be used to its full effectiveness, Wing - under the hands of pilot Heero Yuy - can be said to be the all rounder gundam. Working as efficiently on land as well as in the air and underwater, Wing is configured for both long-range with its buster rifle and short-range combat with the beam saber. Wing Gundam can also be said to be the most unlucky gundam in the series. Having been ditched into the sea after the immediate launch of Operation Meteor when Heero met up with 'Specials' ace pilot Zechs Merquise in Tallgeese, Wing lay under the sea until Heero could find the means to retrieve or destroy it. Unable to retrieve his gundam, Heero settled for destroying it so that OZ would not be able to collect information about the gundams and so fired high-power missiles at it at the same time an unsuspecting Duo had been using Deathscythe to tow it back to land, hoping to use it as a spare suit ^^;. After repairs were made, Wing was self-destructed when to prevent the destruction of a colony, Heero thumbed the switch to buy enough time for Treize to overrule Lady Une's order. While Heero was picked up by Trowa, Wing's parts were once again assembled and repaired by Zechs Merquise in hopes to have a showdown with Heero about who was the better pilot. When both Trowa and Heero made for the colonies, Wing - like Heavyarms - was left on Earth and was later found by Sally Po and OZ. Finally after various exchanges of owners, and with Heero already piloting the madness-inducing Wing Gundam Zero, Wing made its final appearance piloted by Lady Une as she deflected the fatal beam that had been aiming for Treize in Tallgeese II with the gundam's body.